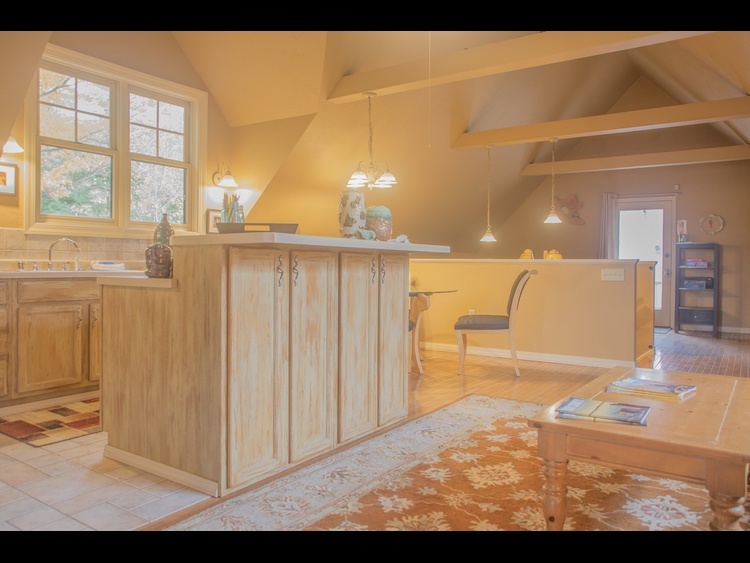 This spacious 1 bedroom(King) with additional sleeping study(sleeps 4) lofts above the trees, giving you a birds eye view of the stunning perennial gardens and walking paths of Plum Bottom Pottery & Gallery, a Door County art destination, featuring nationally collected artists in a variety of mediums. Located on 20 beautiful acres amidst the rolling meadows and woods of Plum Bottom, The Treehouse gives guests the opportunity for a truly unique Door County experience. Nestled in the heart of the County, The Treehouse is the perfect jumping off point for your Door County adventure. Discover 2 Beaches, 3 local wineries, 4 antique malls, 3 golf courses, a petting farm, and a coffee bistro all within a few minutes of The Treehouse. 5 miles to the north lands you in downtown Egg Harbor(Best Small Town in Wisconsin-Wisconsin Trails Magazine), home to some of the best restaurants and shopping in Door County. 20 minutes south finds you in Sturgeon Bay, a jewel of the peninsula. Looking for a night out on the town - 4 Professional theatre's are all within a 20 minute drive. The Treehouse's greatest asset is its Off the Beaten Path attitude! Cyclists will enjoy the least traffic and best country roads in the County. Spend an afternoon in the sunshine meandering through the private prairie paths and explore Plum Bottom's 20 acres. A 300 acre nature preserve(Door County Land Trust) is also just a short walk through the woods! We went to Door County for an off-season weekend with the grand idea of writing a book about love and forgiveness. The Treehouse was the perfect respite, and it allowed us to focus! Wi-fi was key, and it worked with no problems. Anne and Mary in the Plum Bottom Gallery were both warm and welcoming, and we enjoyed getting to meet with them! They will forever be a part of our story. Keep in mind as you approach the property that it is now painted white with no shutters! That threw us off a little when we were looking for it! Thank goodness for good directions! The Treehouse at Plum Buttom was the perfect vacation rental! It was cozy, clean and quiet. It was secluded and romantic yet close enough to visit all the sights. Hopefully we’ll be able to stay there again! 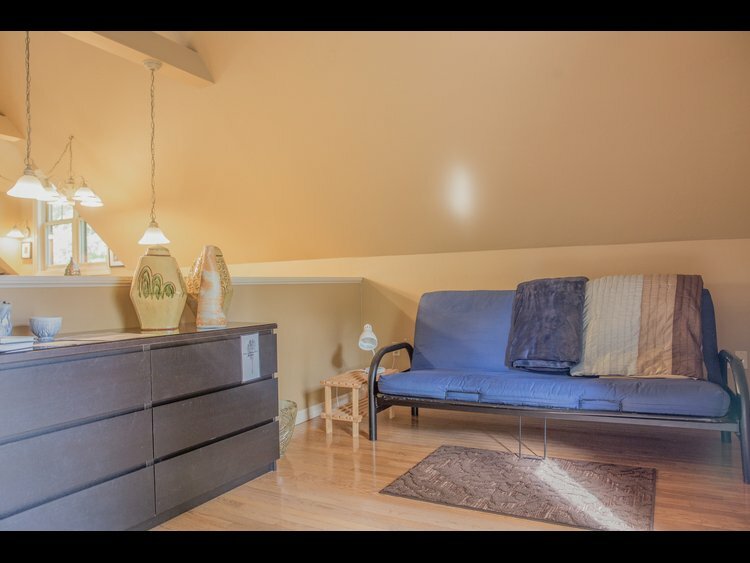 The loft was very nice, stylish, clean and the bed was very comfy. We loved all the windows and tree's. We relaxed each morning by the pond and waterfall with coffee. Very peaceful setting. There is no light pollution so we star gazed at night. We will be back. Shannon, Farmington, MN. As in our previous stays, the service was great and the place was cozy and clean - and at a competitive rate for the secluded experience. Highly recommended. 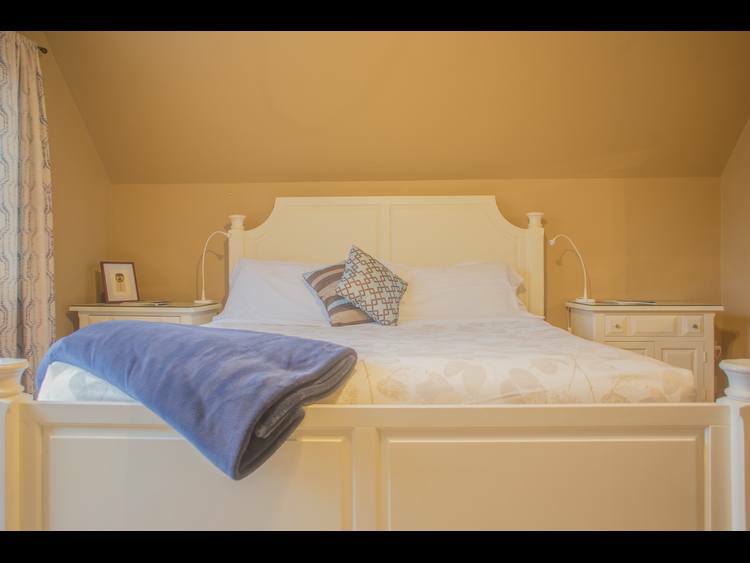 Clean, well appointed, quite, very comfortable bed, attentive owner. 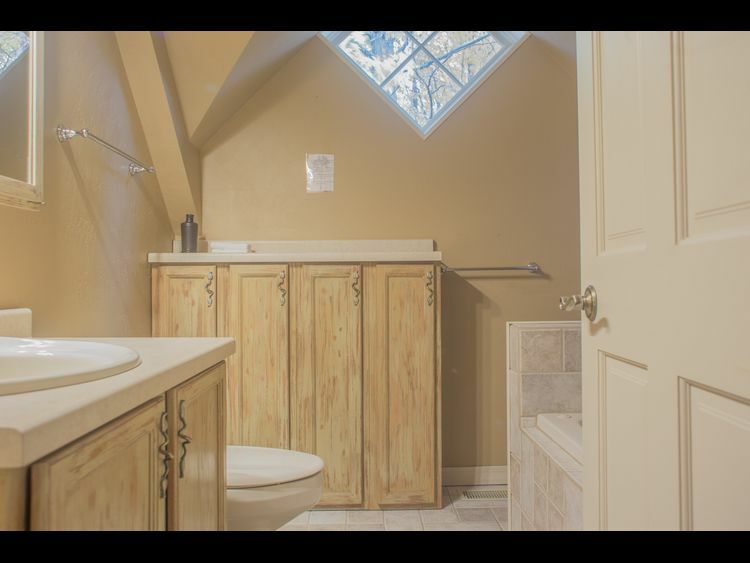 Nicely decorated, large bathroom and kitchen. This was an absolutely lovely place to stay. Impeccably maintained with everything you need. Owners are super easy to work with, provide all the info you need to make your stay comfortable and enjoyable. Highly recommend! We will be back! So clean and such a great feeling at the tree house! My boyfriend and I came up to Door Country for Valentine's Weekend and we're so glad we stayed at the Treehouse! Chad the owner was so accommodating and easy to get in touch with, very professional. Angela, the property manager, was also very friendly and great to talk to! 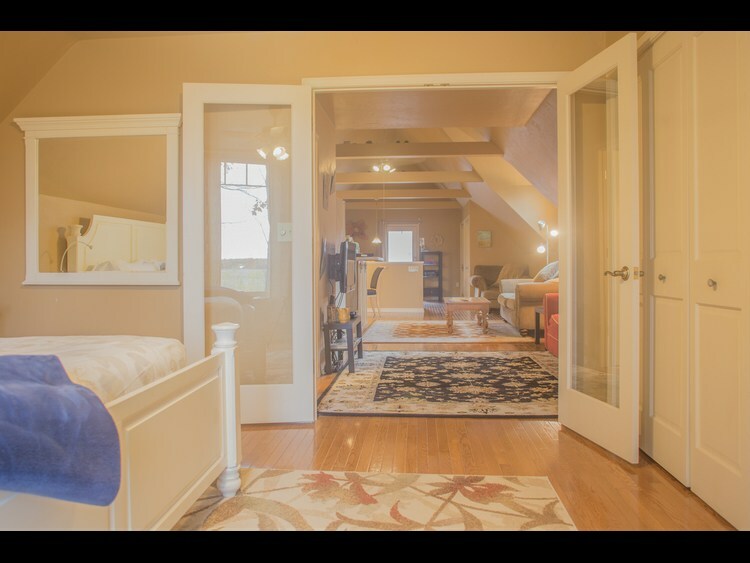 The space is MUCH bigger than the photos make it appear, with gorgeous cathedral ceilings in the main living area. The apartment was clean, well furnished, and very homey. The bed was extremely comfortable, but we both like a soft mattress, someone who prefers a firm bed might not agree. The location couldn't be beat. It's outside of town and set off the road so it's wonderfully quite, but it was a short drive to all the places we wanted to go. Our favorites were hiking at Cave Point, wine tasting at Harbor Ridge Winery (just down the road! ), and dinner at Alexander's of Door county, (make a reservation, even in the off-season). We're planning on visiting Door County again in the 'on-season' when there more to explore and we defiantly plan on staying at the Treehouse again! My husband and I enjoyed staying at The Treehouse during our 10 year wedding anniversary trip. The condo is very specious, comfortable and clean. The local scenery is breathtaking, watching the morning mist among the trees and seeing the stars come out at night. 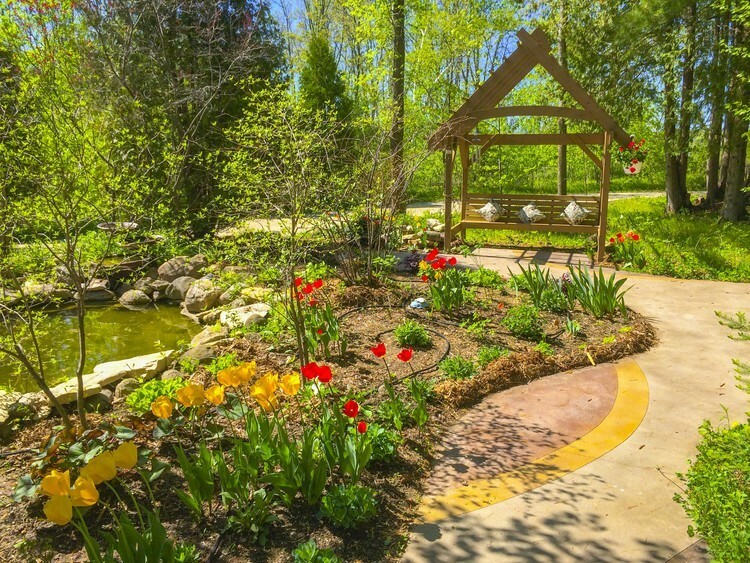 The owner of the location has provided impressively landscaped grounds with beautiful and interesting artwork. Daily we drove up to Egg Harbor or Carlsville to eat. We really enjoyed the friendly hospitality at Door County Coffee and Tea Co and at the Village Cafe. Shipwrecked provided a fun ambiance, and the owner of the Roadhouse was a nice fellow with a very clean eatery. We also headed over to the Packers game at Lambeau, which was incredibly fun, and it was an easy commute back and forth to The Treehouse. I only have one tiny complaint - on Saturday afternoon, the art gallery downstairs became a bit busy, and I felt like I was part of the conversation while I was laying on my bed for a nap, was quite loud. This is our 2nd visit to the Plum Bottom Treehouse. As long as it's available we will be back again. Clean, comfortable, and off the beaten path. We love it here. We had a wonderful time at the Treehouse - the grounds are beautiful and the Treehouse is very clean and cozy. Thank you for a wonderful stay! Good quiet place to stay. Place is incredibly quiet and nice for relaxing. The Treehouse was the perfect place for my boyfriend and I to have a weekend away :) It was cute, clean, and secluded but also only a short drive to all the fun events in Door County. Chad was easy to get in contact with for any questions we had a long the way. I would highly recommend staying here. 5 stars and two thumbs up!! Nice and clean, very quiet. Perfect for a couple. This was the first time we stayed at the Tree House Plum Bottom. This place was great from the minute you walked in. It makes you feel right at home nice and tucked away in the woods. We loved the piece and quiet and it was so beautiful. The place was very clean and cozy and Chad and Anne were great to deal with. We will be staying there again. What a great place to stay. It is close to dining, shopping, exploring, hiking and beautiful views. The accommodations were great. This spacious apartment above an art gallery had everything we needed. We were so comfortable we didn't want to leave. What a beautiful setting!!! It's hard enough to find locations that deliver on all the important parts: cleanliness, comfortable, functional, and quiet. The condo at Plum Bottom goes a few steps further. First, they were very high-touch with their communication before the trip - providing their list of favorite things to do in the area - really great advice. They also had little instruction sheets scattered throughout to guide us on our stay (how to use the TV, how to wrap up "just leave the sheets on the bed" - etc). To top it all off, the potter and art store on the main floor is perfect - has some great pieces at very reasonable prices (gift ideas throughout!). We look forward to staying again sometime, and maybe bringing more family along. My husband and I spent 3 nights in the treehouse rental. It was a very enjoyable stay. All the windows allowed the warmth of the fall colors to show through, and the accomodations were clean and spacious. The manager, Anne, promptly reconnected a cord that had come out of the television when we told her about it. I certainly would recommend the property to others looking for a quiet and beautiful get-away. Love the property. Beautiful scenery, quiet and clean. Nicely decorated with some great pottery pieces. Enjoyed playing one of the board games and would love to have seen another option too for the quieter off season. Owners were nice and seem to be quite attentive to suggestions. Had a great two night stay! Great property and amenities. Loved the modern and updated appliances. However there was a bit of a bug problem, specifically hornets and Asian Beetles. We had a lot get inside even though we only opened the door for coming and going. They would get through the screen door. Other than that it was a great place to stay. 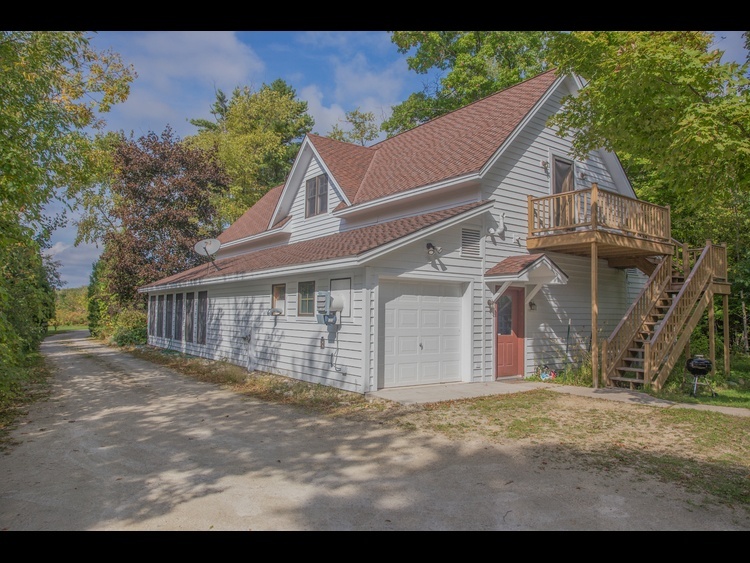 We're happy you enjoyed The Treehouse's peaceful location and our modern amenities:) Ahhh, the joys of nature - once every few years the asian beetles(lady bug look a-likes) find Door County and are gone as quickly as they appear. This year they came for a couple days and then moved on. We're sorry a few got inside and will do our best to keep them in nature where they belong (I've tightened the screen door:) We hope to see you again soon! We had another wonderful visit, with the Treehouse as our home base. It was not as private this time as there is another rental property in the next building. Three cars coming and going reminded us we were not alone. But, the neighbors were quiet enough and we still felt happy to be away from the bustle of the tourist traffic in town. Thank you for visiting us again! We're happy you had another wonderful trip to The Treehouse. Yes, we do have a second, separate and private vacation rental located on our spacious 20 acre nature preserve. 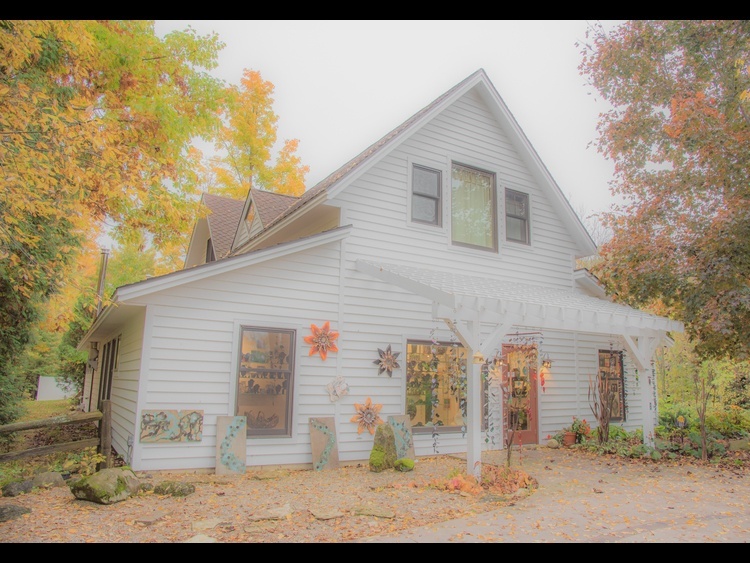 Both these properties are the ideal centrally located jumping off point for your Door County Adventure. 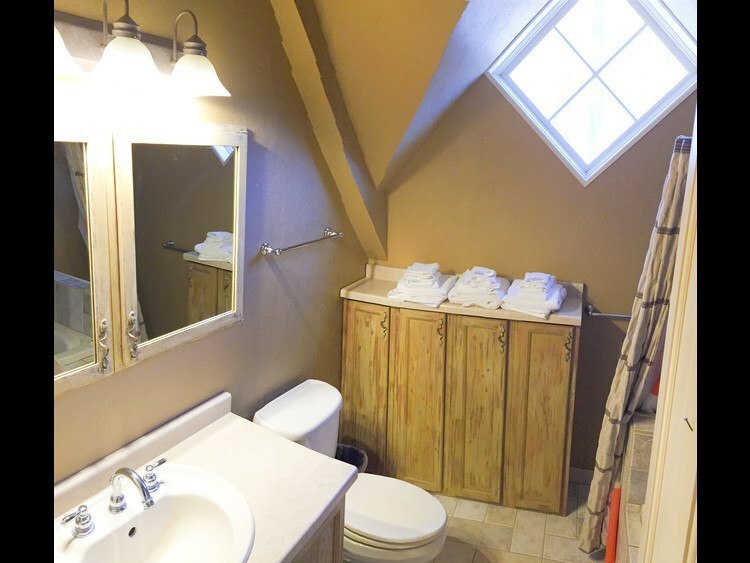 We work hard to make sure each space has its own privacy and seclusion. We hope to see you again soon! Clean comfortable accommodations that exceeded our expectations. Would definitely stay here again and plan on making reservations for here next year. Loved our stay! Wish we had more time there, so secluded & hidden. Love this place & will be coming back!! The location was perfect for all the different hiking and nature areas we wanted to explore. The accommodations were lovely - we had everything we needed and the attention to detail was exquisite.The gallery and grounds are outstanding and were a welcome and peaceful return from our explorations. Plum Bottom is a delightful place. 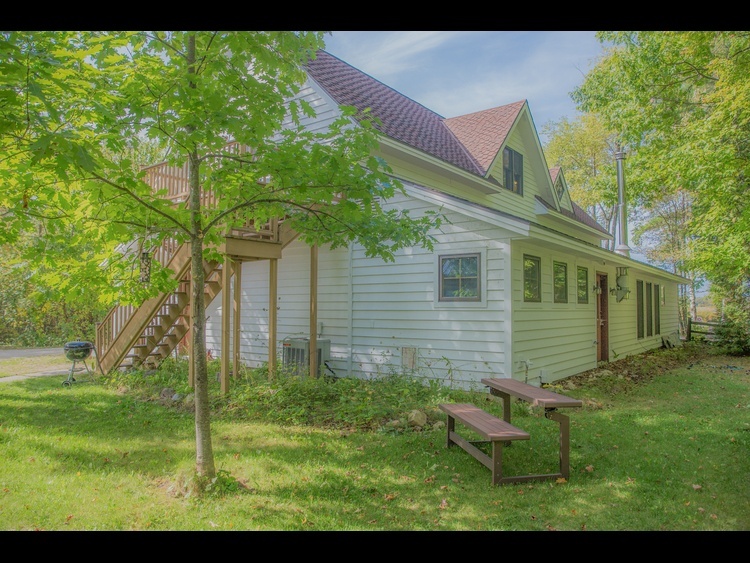 It is off the beaten track so quiet and secluded, but only a 5 minute drive from Egg Harbor so close to everything Door County has to offer. The apartment is well described by the owners and they give all necessary information before you arrive (access code, wifi instructions and items not supplied - like paper products and charcoal for the grill). 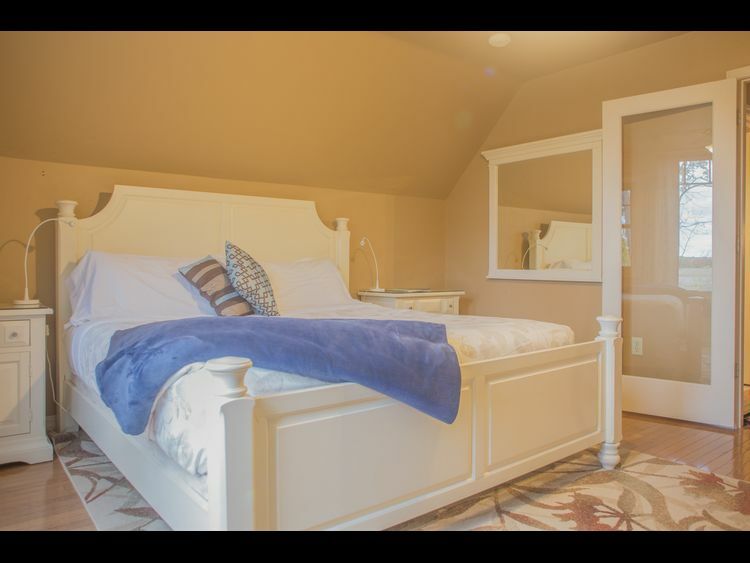 There was ample closet space, sofas for lounging and a TV as well as an additional full bed. The kitchen was well equipped and the fridge full-sized. We were never aware that the pottery itself was underneath us. The only reason I didn't check everything on the "recommend this property for" list is because the apartment is accessed by steps that might be difficult for people with disabilities, and it is easier if you have a car to get around. We had a very relaxing vacation and will certainly book again when we're back in Wisconsin! Clean, quiet, and central spot! The Treehouse was great! It was very clean and well stocked with towels and kitchen supplies. The location was perfect for exploring Door County - Washington Island, Sister Bay and Whitefish Dunes are a must. House was well equipped and clean. Was architecturally very interesting and comfortable. We liked that there were brochures we could page through. Owners were personable and willing to answer questions. It was so nice waking up each morning with the trees and birds singing right outside the window. Very peaceful country setting. Yes, The Treehouse has become a favorite stop for migrating birds and its always a treat to see who stops by to say hello:) We're thrilled you enjoyed your stay and hope to see you again soon. The Treehouse was clean, spacious and had everything we needed for our stay. 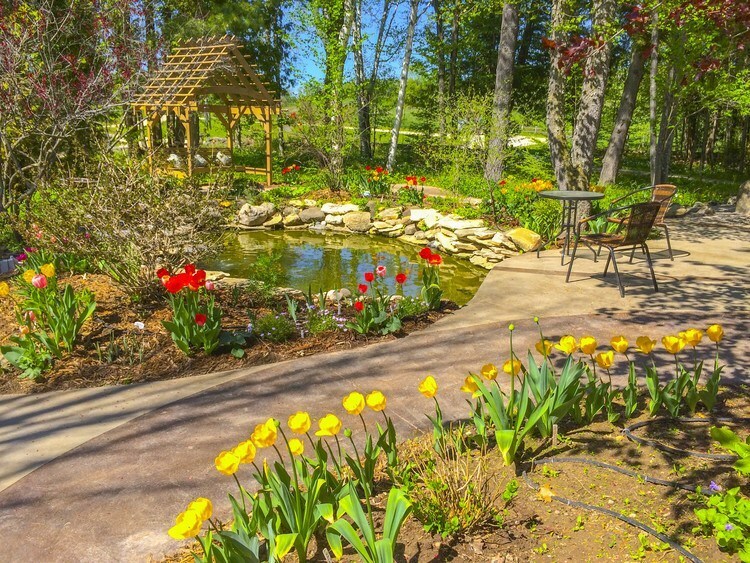 It was located in a great spot and the landscaping is impressive. The treehouse fit our needs perfectly. Spotlessly clean. Great quiet getaway for the weekend. We loved it. The apartment was awesome and very clean. Other than during the day we were there by ourselves making for a romantic weekend alone. You have everything you need in the apartment and everthing else within a 10 min drive. We had a great time and would do it again. Out of the way, get away--but close to everything. Quiet, roomy, with views from every window or the late October color. Second floor walk up over the artist studio and shop. Bring a book and enjoy the solitude. My wife and I stayed for a weekend getaway, and we loved the peace and tranquil feeling that this very roomy accommodation afforded. 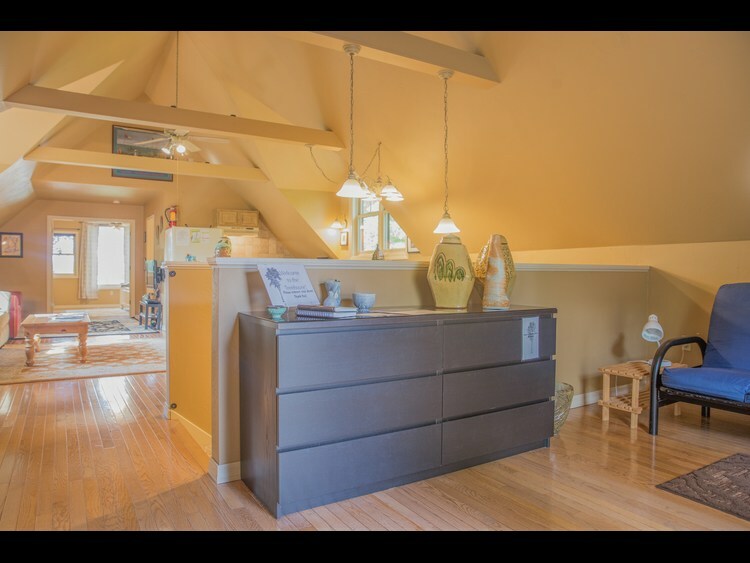 Nestled into the property on a winding road, the upstairs of the pottery studio was very comfortable and well laid out. It was just what was needed after a busy day of visiting the local wineries and galleries and touring the surrounding towns. The pottery studio downstairs has very beautiful and unique pieces of pottery as well as jewelry and artwork by local artists. We'll definitely be back! So happy we found this place. Though the weather was not ideal during our stay, we had a terrific time staying in Door County, particularly as we were at the Treehouse. It was beautiful inside and out, and very private. We enjoyed being so centrally located but not in the heart of tourist activity. Everywhere we wanted to go involved only very short drives. We will stay here again, for sure. My husband and I were lucky enough to find this cozy cabin to stay in for our four year anniversary. The weather was cold and rainy, so we were glad to have such a nice place to stay with a beautiful view onto the garden below. It was nice to have a full kitchen so we could eat some of our meals in, and I especially loved the sign welcoming us when we first arrived. We'd definitely stay here again! We stayed at the Treehouse for our honeymoon. It is very spacious, has all of the amenities you will need. It is tucked back in the woods, very quiet and scenic. Great landscaping! The shop is only open 9-5, so you are pretty much there alone after 5. 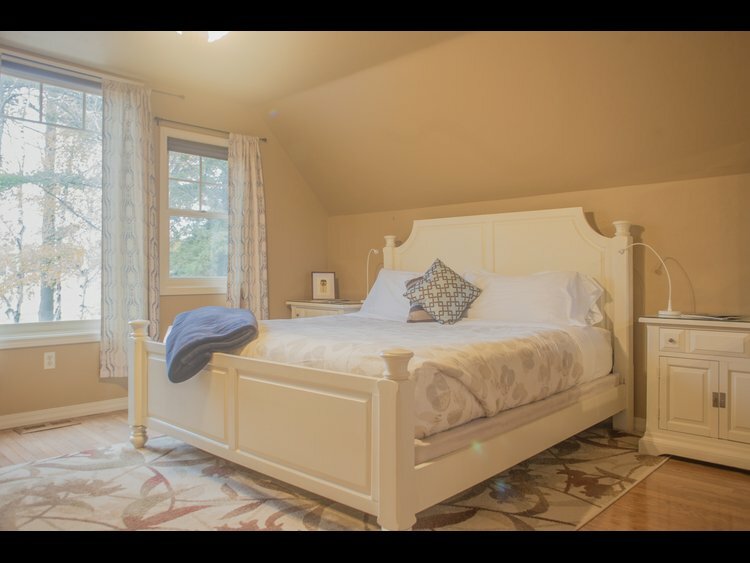 Great location, close to wineries and towns. I would stay here again. My husband and I came here for our mini-moon right after our wedding. It was the perfect setting to relax and unwind. 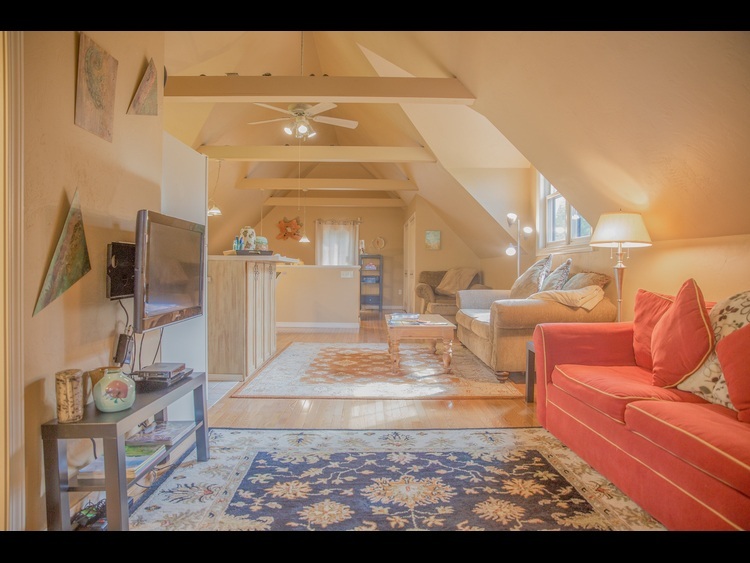 The Treehouse is a little off the beaten path so you feel like you are in a special place, but also conveniently located nearby cute shops and beautiful state parks. Chad is the perfect host and so sweet that his gallery and workshop are right downstairs. 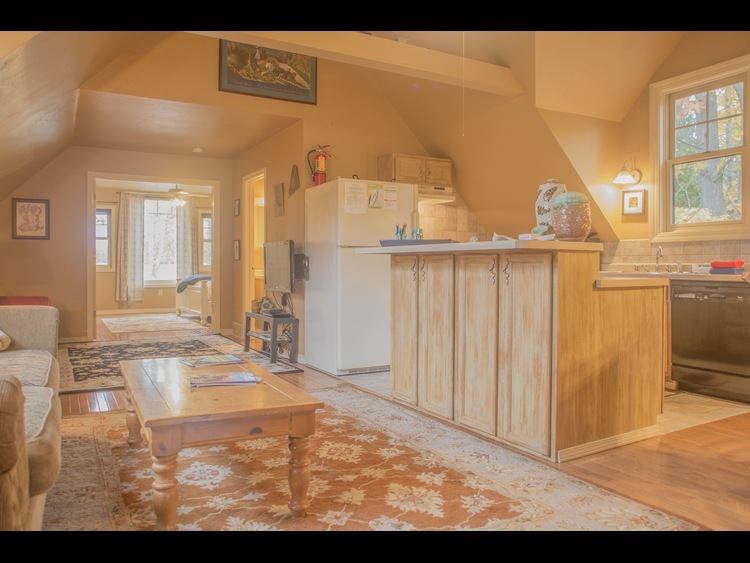 The apt has everything you need to make home-cooked meals if you prefer and the setting is so tranquil surrounded by beautiful greenery, plants and flowers - a true Treehouse! It's such a comfortable and well-equipped vacation rental, we will definitely be back next time we visit Door County. This vacation rental was a great reasonable get away. Very cozy inside with all you need for a comfortable stay. Very quite on a secluded 20 acres of property to roam. We had breakfast out by the pond with all the flowers and beauty all around. At night you enjoyed listening to the water feature and seeing the stars out your window. The location was perfect with a short drive to Egg Harbor and the coast for local parks. Back roads great for biking. We loved it here and plan to make this our stay while in Door County. My wife and I took a 5 day getaway for our anniversary. The location, solitude, and beauty of the setting was wonderful. The trip was just what we needed and would love to do it again. The Treehouse was close enough to be convenient, but far enough away to give that country hideaway feeling. The decor was modern, yet warm and inviting. We loved it! We're happy you had a great anniversary trip. We hope you visit us again, it was a pleasure having you at the Treehouse. Great location away from the busy tourist areas. Quiet, clean and cozy! The place is much bigger than it looks in the pictures online. More space that what's needed for 2 people. It has all the comforts of home - we cooked, ate meals, lounged on the sofa (and in the whirlpool). It was quiet and serene. The gardens were lush and fragrant - a perfect spot to enjoy a cup of coffee. We drove all over the northern end of the county over the course of 2 days. It was nice to be close to all the sights and stores but away from the crowds. My only regret is that we couldn't open the windows to enjoy the fresh air and cool evening breezes since the air conditioner was on. (we didn't ask if it could be turned off, so this may have been an option). We will definitely return. Absolutely lovely! We loved our stay so much, we are planning on coming back next year. We are so happy you enjoyed your stay! We'll see you again soon! I am thrilled to have found The Treehouse at Plum Bottom. My husband and I stayed for three nights over Memorial Day weekend and thoroughly enjoyed our stay. The Treehouse is off the beaten path, yet still easily accessible from both sides of the peninsula. It's tucked away in a quite nature preserve above the Plum Bottom Gallery. The rental itself is spacious and tastefully appointed. The two of us had plenty of room to move around and did not feel cramped at all. 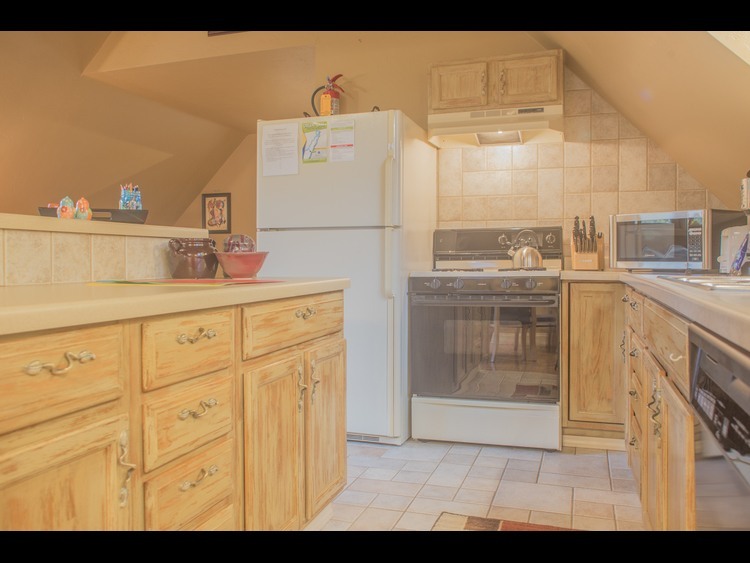 Had we grocery shopped or bought food to prepare, the Treehouse comes complete with the comforts of home, including a full size fridge, microwave, dishwasher and stove. It is clean, quiet and comfortable and I'd recommend it to anyone looking for a lovely getaway.